Birla Industrial & Technological Museum (BITM) organized the West Bengal Student’s Science Seminar 2014 in its auditorium on September 6, 2014. Shri Rajesh Pandey, IAS, Secretary, Youth Services Dept., Govt. of West Bengal inaugurated the seminar in the presence of Shri G. S. Rautela, Director General, National Council of Science Museums and Sk. E. Islam, Director, Birla Industrial & Technological Museum. The topic of this year was ‘Innovations in Agriculture for a Sustainable Future: Prospects & Challenges’. 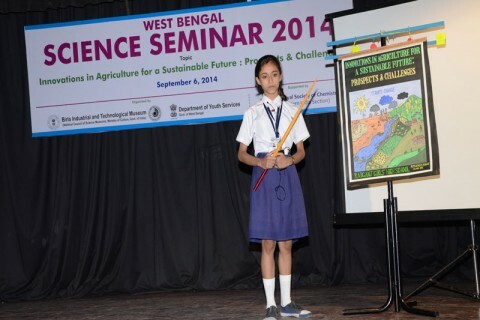 20 prize winning students of District Science Seminar held in 20 districts of West Bengal, participated in this seminar. Prof. Chittaranjan Kole, Vice-Chancellor, Bidhan Chandra Krishi Viswa Vidyalaya and Prof. Sukumar Aditya, President, Royal Society of Chemistry, Eastern India Section awarded prize to the winners. 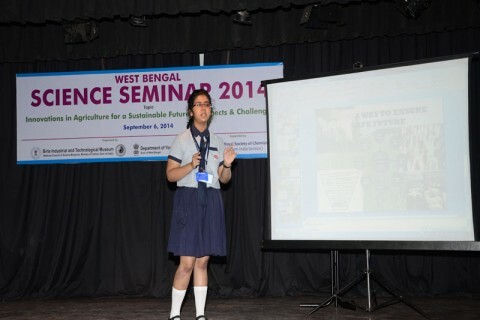 Miss Mayurakshi Mukherjee from Techno India Group Public School, Siliguri, Darjeeling stood first and will represent West Bengal in the National Science Seminar to be held at Bangalore on 11th October 2014.